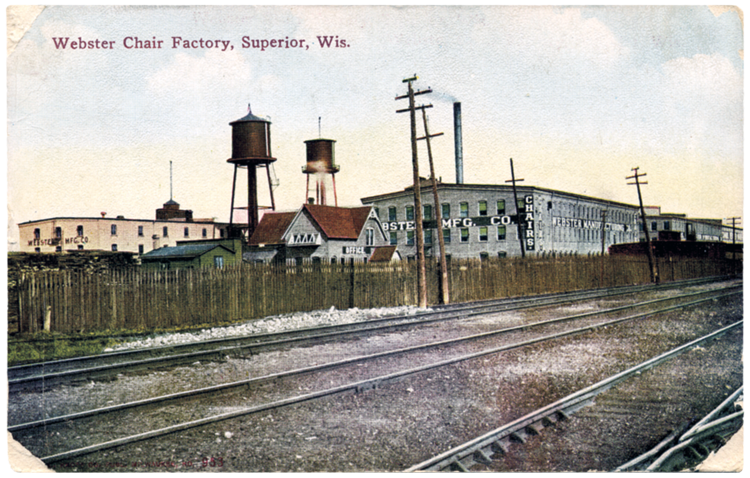 As early as 1891 A. J. Webster was making chairs in Superior. Stumpage, cut by factory workers, arrived in Superior from all across Wisconsin to be made into chairs. By 1915 the company offered nine hundred different styles of chairs and operated branches across the country. In 1927 the Superior factory alone employed five hundred workers, and by that time they were making other furniture besides chairs. The Great Depression caused the company to close in 1932. It reopened briefly in 1935, but closed for good just two years later. Information on its demolition is vague. At one time the company had been the largest chair manufacturer in the world. Today, chairs made by the Superior company are highly valued by antique collectors, and the lot on which the factory stood is empty.